Polish Radio Two is webcasting two concerts tonight (April 18) in memory of victims of the Smolensk tragedy‏. Find Polish Radio Two here, convert Polish time to local here. Terrible thing to happen to the Poles. 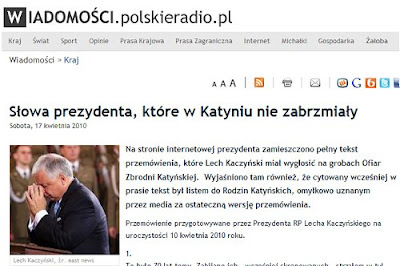 Though I wouldn't want to whitewash, former President Kaczynski's moralistic repression.